PVC awning draught skirt complete with wheel arch cover for Motorhomes with awnings up to 5.5m in length. 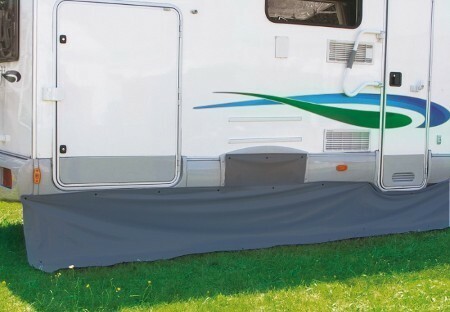 Fiamma Skirting offers protection against wind and rain eliminating drafts in the awning from under the vehicle. Made in weatherproof, easy clean PVC in grey colour, the Fiamma Motorhome Skirting is supplied with snap fastener installation kit. Fiamma Skirting Motorhome measures 550cm long and 60cm high and the non-fray material can be cut down to suit smaller awnings. Supplied with SINGLE wheel arch cover measuring 75cm across.